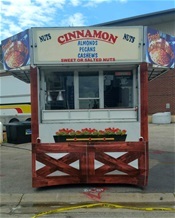 The cinnamon roasted nuts are at most summer events around Milwaukee and Wisconsin during the summer months..A delicious favorite of fair goers. I'll be back to tell you more about this great event.. also I want to let you know the Cinnamon roasted nuts are a favorite there ! The month of August is a busy time, preparing for the end of summer...It's our last chances for that weekend getaway at a lake or a hike in the still green forests. A weeklong trip out West, out east or where ever your interests want to take you. Reality sets in and families start to prepare for 'back to school' chores..books to buy, school clothes to buy or get ready. A cottage being closed up until next year. August can be very hot in my part of the country. The last blast of summer heat I guess. In Wisconsin, our summer starts out slowly. This year June was fair and in the low seventies, July brought on some heat for all the favorite ethnic events held on the Summerfest grounds. At the end of June to start the season it's Polish Fest, and the largest music festival in the country,Summerfest for 10 days. July, Italian Fest and Germanfest, August we have Irish Fest, These are some of the favorite ethnic festivals to attend. The big fair event of the summer here is the Wisconsin State Fair, usually the first 12 days of August. Along with enjoying the culture displays music and dances, Ohnhh the delicious foods to sample. For instance, Polish pierogi A dumpling filled with meat or cheese. The Italian Rice Ball..filled with cheese, meat and maybe spinach covered with a delicious marinara sauce. ( I look for this treat right away.) At Germanfest my treat is spaetzle ( little dumplings) and gravy..! At Irish fest, Irish stew is a favorite of many. I for one enjoy the Irish cookies and the coffee with Baileys Irish Cream. The flag throwers at Festa Italiana, the Irish jig dancers at Irish Fest The German oompah bands ...make this time very special. I hope you were able to enjoy summer in Wisconsin, the festival state! Beautiful Wisconsin has so much to offer travelers in the summer..and year around, I'll talk about that in another post for a season soon to be here. I am looking forward to September and my fall trip with the Honor Society with Lifeline Church..We're headed to Mt. Rushmore and the Badlands..I am even happier about this trip because my sister Donna from Florida will join me ..yippee! "This is the day the Lord has made, let us rejoice and be glad in it".